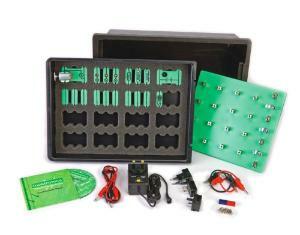 This kit provides an introduction to the fundamentals of electricity. It's ideal for those who are new to the subject and is suitable for use from ages eight and up. The kit includes carriers, a baseboard, power supply, and 30 pages of notes and worksheets on CD ROM. Learning objectives and experiments include electricity basics, simple electrical components, the simplest circuit, conductors and insulators, switches, two-way switches, series circuits, parallel circuits, buzzers, and motors.